As a gamification designer, it is easy to get hooked up on the intricacies of the system. The feedback mechanics, the game mechanics, the economy and the cleverness of it all. It is also easy to think, “this is going to be great” when you have a new idea and then spend waaay to long making the idea real. What we need to do is step back from time to time and say “How will this actually impact the user”. For example. You have this fabulous animation that you want to make use of. It fits the overall theme of the gamified solution you are building and think that it adds a little bit of playfulness to break up part of the process. Great. However, what does it really give the end user? If it is used once and adds some greater value to the process they are going through, by giving a new understanding or insight – then brilliant. If it really does give the user a break for a particularity complex part of the process, then okay. If it sits there and forces them to watch it, possibly more than once with no option to skip – step away from the idea. You see, you think it is awesome and fun, the user sees it as something that is getting between them and the end of the process they are going through. They don’t really care that you spent 20 hours perfecting the animation. They have no interest that you missed your child’s birthday party to add this bit of light relief just for them. They only care that it added time to a process or interfered with it. 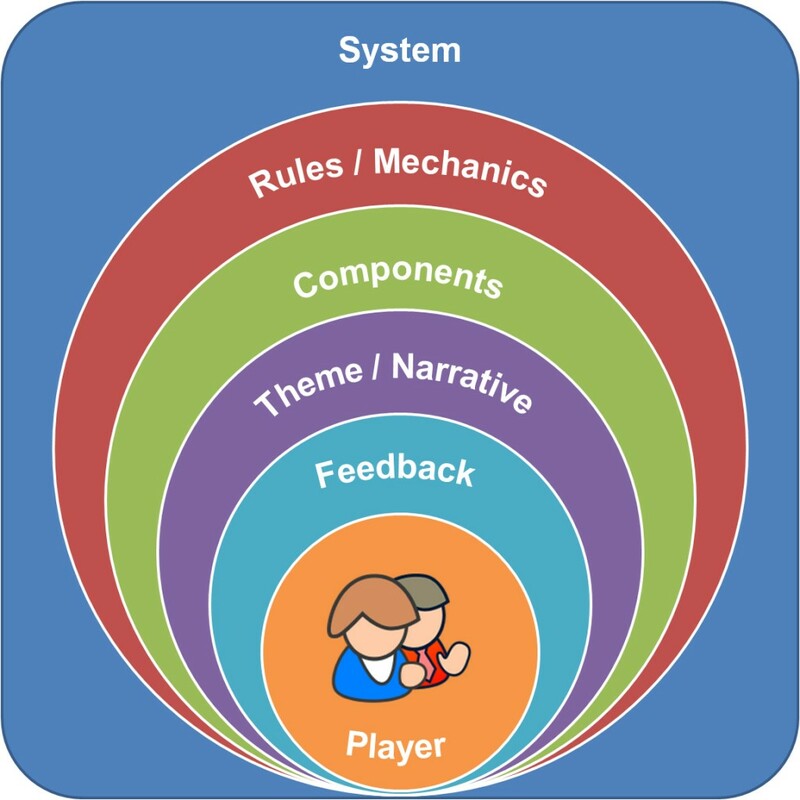 If you look at the wonderful MDA framework that is popular with game designers and gamification designers a lot, you can see a good illustration of how the designers and the users perspective of the system differ. Designers look at a system the opposite way to a user. They consider the mechanics, the dynamics and then the aesthetics. The user sees the system in the opposite way, the aesthetics being what they feel impacts them most. I wanted to expand that a little for gamification, so I came up with the following. It shows some of the main parts of a gamified system and how far removed the user is from really caring about them! 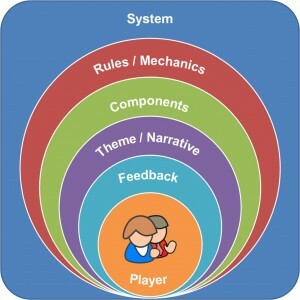 If you consider System is the end the designer / developer is sat at and player is, well, the player. How I see it, the player is most impacted by the feedback your system provides. This is what will frame the experience for them and what gives them their sense of progress, achievement, motivation etc. Feedback can be anything from the word “correct” on a test, to the outputs of a full virtual economy and the screen flashing and dancing! Components are things like progress bars and the like. Whilst they are part of feedback, the design and whizzyness of them is not always that important to the user – just as long as they work and don’t interfere! Finally the rules and the mechanics. This is what makes the system work. They define how the system will feedback based on the users actions. The user does not care about this – they will only notice the existence of the mechanics and rules if they interfere with the users tasks! Sadly, the fact of the matter is, the user does not care how clever the designers were. They just want a system that works and that is usable. As a designer, your problems are not the users problems. However, the users problems are most definitely your problems!